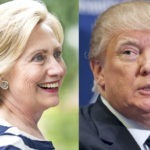 After a month of stagnant poll numbers showing Hillary Clinton consistently ahead of Donald Trump in the national polls by a comfortable but not blowout margin, signaling that the election has grown stagnant and will likely remain that way until after the first debate, CNN came out of nowhere yesterday with a new poll which claimed that Trump had suddenly pulled ahead with a two point lead. If the poll sounded unrealistic, your instincts have proven correct. In fact NBC News has dived into the CNN poll and mathematically proven that it was rigged to cater to a particular result. In an attempt at staving off potential viewer boredom with the increasingly stagnant election, CNN and others have been inaccurately claiming that the polls have been “tightening” by either pointing to outlier polls or leaving poll numbers out of their claims entirely. But CNN took things a step too far when it changed up the methodology of its own poll in an attempt at providing some validity to its ongoing “tightening” claim. In fact CNN took things so far beyond the pale that another major television network is now publicly shredding it. So just what did CNN do? In order to conduct accurate polls, the pollsters have to start by working with the percentage of registered Democrats and Republicans and independents who typically vote in a Presidential election, and then sampling a representative number of voters from each. But for this new poll CNN cheated by over-sampling registered Republicans to the tune of four percent above the break-even mark and eleven percent above the actual electorate. Chuck Todd of NBC News was quick to point this out while on-air, thereby providing the mathematical proof of how CNN went about rigging its poll to falsely show that Donald Trump had suddenly taken the lead. NBC estimates that when the sampling of the CNN poll is adjusted back to numbers which represent real-world voters, it shows Hillary Clinton holds a four point lead. In other words, nothing has really changed in the election, even as CNN sinks to a new low.